DIY Supercharger Conversion with Intercooler for 948, 1098, 1275 A-series MG Midget, Austin Healey Sprite, and Morris Minor. The venerable A-series engine is the beating heart of some of Britain's most beloved automobiles, but achieving a meaningful increase in horsepower requires dismantling the engine and spending serious money. Also, using conventional means to modify a naturally-aspirated A-series to achieve 100 h.p. or more negatively impacts the engine’s street manners and fuel economy. A viable alternative is forced induction, via a turbocharger or supercharger. Each method has its benefits and drawbacks. 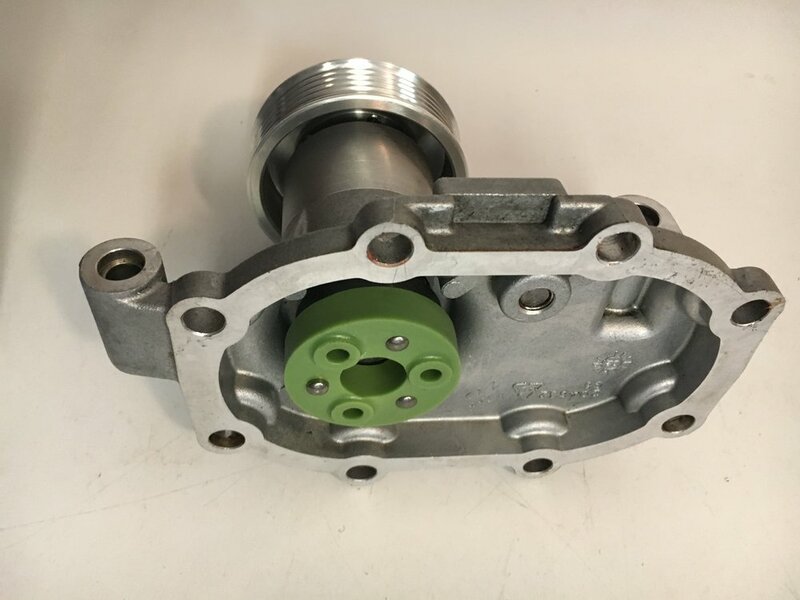 Turbochargers have been successfully fitted to the A-series engine, but no kits, fabrication templates, or detailed instructions are available. Also, turbochargers require custom exhaust work and exhibit a slight lag in generating boost. However, if you prefer a turbo, you no longer need to find a costly MG Metro manifold and clumsy cast snorkel adapter, which requires hacking a hole in your Spridget's bonnet to create sufficient clearance. Creative Spridgets now offers a CNC-machined snorkel adapter and performance air cleaner mount for the SU HIF44 carburetor, available here and pictured below. The profile of the ram pipe is optimized to accelerate the intake charge as it enters the carburetor’s throat, and works very well with naturally aspirated cars as either a direct- or remote-mount for a K&N-style performance air filter. The SU HIF44 mounts directly to a Minispares C-AHT770 cast aluminum manifold, which costs just $67 including shipping from the United Kingdom. You can convert a standard HIF44 for pressurized operation as described here. Superchargers provide instantaneous boost and require no custom exhaust work. But until now, only two systems would fit under the Spridget's sloping bonnet: the Moss Motors 'roots style' kit, which costs $4,400, and the High Performance Products twin-screw offering, which begins at $6,000. Mama mia! In addition to their excessive cost, neither system can be fitted with an intercooler. As a result, the amount of boost these systems can handle without harmful detonation and back-firing is quite limited, unless you disassemble the engine and install low-compression pistons or resort to band-aid solutions like water or ethanol injection. But now, there's another option: the Creative Spridgets DIY intercooled supercharger conversion for the 948, 1098 and 1275 A-series MG Midget, Austin Healey Sprite, and Morris Minor! True to our aim of providing the least expensive route to desirable performance upgrades, adding a supercharger and intercooler to your A-series powered vehicle can be done for under $3,000—a savings of at least $1,400. If you already run a single SU HIF44 and are able to locate a serviceable used supercharger, your cost may be closer to $2,000—but that’s for an intercooled supercharger system. Installing a supercharger and intercooler on an otherwise stock 1275cc A-series engine will increase horsepower by 50% to approximately 100 h.p., without triggering harmful detonation or impacting your Spridget’s smooth idle and street manners. Adding high-lift rocker arms, a long-center-branch header, free-flowing 1.75" exhaust system and smaller supercharger pulley will net even more power. Standing-start acceleration is dramatically improved, as are passing and hill-climbing in top gear. Our intercooled supercharger conversion is compatible with an SU HIF44 carburetor, or electronic fuel injection. Keep your eyes peeled for our hybrid GM/Hitachi DIY EFI conversion—presently in research & development—or source a throttle body and aftermarket ECU of your choice. *Note: we have designed a bespoke GM-style temperature sensor mount, primarily to enable EFI for A-series engines. However, the mount is also necessary to supercharge cars fitted with an early, down-flow radiator or a VW Rabbit dual-pass crossflow radiator (the latter conversion will soon be posted on this website). Our intercooled supercharger conversion utilizes Eaton's M45 (45 C.I.D.) blower, model no. 207018, which is OEM equipment on the 1999 to 2003 Mercedes Benz SLK230 Kompressor coupe and some 1999-2000 Mercedes Benz C230 models without an electronic clutch. *NOTE: there are several different blowers mounted to smaller Mercedes engines, but they are NOT compatible with our manifold. Make sure that what you get matches these photos, does NOT have an electronic clutch, and is Eaton model number 201078. The longer number is the Mercedes designation. A single inlet/outlet manifold not only dramatically reduces production cost, a savings we pass on to you; it enables an intercooled conversion that fits beneath the Spridget's sloping bonnet. While fitting an intercooler is optional, doing so provides a cooler, denser mixture and eliminates the need to retard the timing or dismantle the engine to install low-compression pistons. The same pulley combination should produce slightly greater boost at lower elevations, and of course internal engine modifications (and the condition of your engine) will yield varying results. Please use our contact form and we will post the figures you achieve in a table on this page. 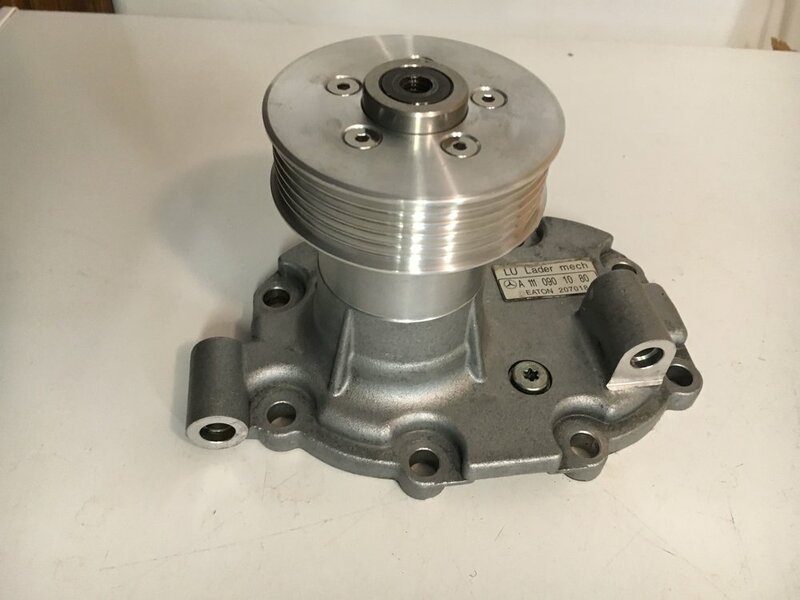 To get started, visit our purchasing page to order an M45 supercharger manifold, SU HIF44 snorkel adapter, the thermostat housing adapter (if running a vertical flow radiator), and the 5-rib crankshaft and water pump pulleys required for the serpentine belt conversion. You can then run your car as usual, naturally aspirated, while completing the balance of the conversion in stages to suit your budget and time constraints. We will soon be posting free downloadable templates to fabricate the mild steel supercharger mounts, and step-by-step installation instructions with detailed photos.